Appropriate cleaning of historic masonry. Photo: NPS files. Inappropriate cleaning and coating treatments are a major cause of damage to historic masonry buildings. While either or both treatments may be appropriate in some cases, they can be very destructive to historic masonry if they are not selected carefully. Historic masonry, as considered here, includes stone, brick, architectural terra cotta, cast stone, concrete and concrete block. It is frequently cleaned because cleaning is equated with improvement. Cleaning may sometimes be followed by the application of a water-repellent coating. However, unless these procedures are carried out under the guidance and supervision of an architectural conservator, they may result in irrevocable damage to the historic resource. Ninety years of accumulated dirt and pollutants are being removed from this historic theater using an appropriate chemical cleaner, applied in stages. Photo: Richard Wagner, AIA. The purpose of this Brief is to provide information on the variety of cleaning methods and materials that are available for use on the exterior of historic masonry buildings, and to provide guidance in selecting the most appropriate method or combination of methods. The difference between water-repellent coatings and waterproof coatings is explained, and the purpose of each, the suitability of their application to historic masonry buildings, and the possible consequences of their inappropriate use are discussed. The Brief is intended to help develop sensitivity to the qualities of historic masonry that makes it so special, and to assist historic building owners and property managers in working cooperatively with architects, architectural conservators, and contractors. Although specifically intended for historic buildings, the information is applicable to all masonry buildings. This publication updates and expands Preservation Briefs 1: The Cleaning and Waterproof Coating of Masonry Buildings. The Brief is not meant to be a cleaning manual or a guide for preparing specifications. Rather, it provides general information to raise awareness of the many factors involved in selecting cleaning and water-repellent treatments for historic masonry buildings. First, it is important to determine whether it is appropriate to clean the masonry. The objective of cleaning a historic masonry building must be considered carefully before arriving at a decision to clean. 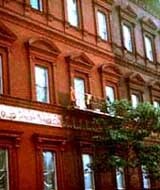 There are several major reasons for cleaning a historic masonry building: improve the appearance of the building by removing unattractive dirt or soiling materials, or non-historic paint from the masonry; retard deterioration by removing soiling materials that may be damaging the masonry; or provide a clean surface to accurately match repointing mortars or patching compounds, or to conduct a condition survey of the masonry. The general nature and source of dirt or soiling material on a building must be identified to remove it in the gentlest means possible--that is, in the most effective, yet least harmful, manner. Soot and smoke, for example, require a different cleaning agent to remove than oil stains or metallic stains. Other common cleaning problems include biological growth such as mold or mildew, and organic matter such as the tendrils left on masonry after removal of ivy. If the proposed cleaning is to remove paint, it is important in each case to learn whether or not unpainted masonry is historically appropriate. And, it is necessary to consider why the building was painted. Was it to cover bad repointing or unmatched repairs? Was the building painted to protect soft brick or to conceal deteriorating stone? Or, was painted masonry simply a fashionable treatment in a particular historic period? 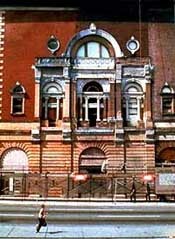 Many buildings were painted at the time of construction or shortly thereafter; retention of the paint, therefore, may be more appropriate historically than removing it. And, if the building appears to have been painted for a long time, it is also important to think about whether the paint is part of the character of the historic building and if it has acquired significance over time. Some gypsum or sulfate crusts may have become integral with the stone and, if cleaning could result in removing some of the stone surface, it may be preferable not to clean. Even where unpainted masonry is appropriate, the retention of the paint may be more practical than removal in terms of long range preservation of the masonry. In some cases, however, removal of the paint may be desirable. For example, the old paint layers may have built up to such an extent that removal is necessary to ensure a sound surface to which the new paint will adhere. Although not always necessary, in some instances it can be beneficial to have the coating or paint type, color, and layering on the masonry researched before attempting its removal. Analysis of the nature of the soiling or of the paint to be removed from the masonry, as well as guidance on the appropriate cleaning method, may be provided by professional consultants, including architectural conservators, conservation scientists, and preservation architects. 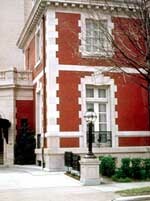 The State Historic Preservation Office (SHPO), local historic district commissions, architectural review boards, and preservation-oriented websites may also be able to supply useful information on masonry cleaning techniques. The decorative trim on this brick builing is architectural terra-cotta intended to simulate the limestone foundation. Photo: NPS files. The construction of the building must be considered when developing a cleaning program because inappropriate cleaning can have a deleterious effect on the masonry as well as on other building materials. The masonry material or materials must be correctly identified. It is sometimes difficult to distinguish one type of stone from another; for example, certain sandstones can be easily confused with limestones. Or, what appears to be natural stone may not be stone at all, but cast stone or concrete. Historically, cast stone and architectural terra cotta were frequently used in combination with natural stone, especially for trim elements or on upper stories of a building where, from a distance, these substitute materials looked like real stone. Other features on historic buildings that appear to be stone, such as decorative cornices, entablatures and window hoods, may not even be masonry, but metal. Previous treatments of the building and its surroundings should be researched and building maintenance records should be obtained, if available. Sometimes if streaked or spotty areas do not seem to get cleaner following an initial cleaning, closer inspection and analysis may be warranted. The discoloration may turn out not to be dirt but the remnant of a water-repellent coating applied long ago which has darkened the surface of the masonry over time. Successful removal may require testing several cleaning agents to find something that will dissolve and remove the coating. Complete removal may not always be possible. Repairs may have been stained to match a dirty building, and cleaning may make these differences apparent. De-icing salts used near the building that have dissolved can migrate into the masonry. Cleaning may draw the salts to the surface, where they will appear as efflorescence (a powdery, white substance), which may require a second treatment to be removed. Allowances for dealing with such unknown factors, any of which can be a potential problem, should be included when investigating cleaning methods and materials. Just as more than one kind of masonry on a historic building may necessitate multiple cleaning approaches, unknown conditions that are encountered may also require additional cleaning treatments. Any cleaning method should be tested before using it on historic masonry. Photo: NPS files. The importance of testing cleaning methods and materials cannot be over emphasized. Applying the wrong cleaning agents to historic masonry can have disastrous results. Acidic cleaners can be extremely damaging to acid-sensitive stones, such as marble and limestone, resulting in etching and dissolution of these stones. Other kinds of masonry can also be damaged by incompatible cleaning agents, or even by cleaning agents that are usually compatible. There are also numerous kinds of sandstone, each with a considerably different geological composition. While an acid-based cleaner may be safely used on some sandstones, others are acid-sensitive and can be severely etched or dissolved by an acid cleaner. Some sandstones contain water-soluble minerals and can be eroded by water cleaning. And, even if the stone type is correctly identified, stones, as well as some bricks, may contain unexpected impurities, such as iron particles, that may react negatively with a particular cleaning agent and result in staining. Thorough understanding of the physical and chemical properties of the masonry will help avoid the inadvertent selection of damaging cleaning agents. Other building materials also may be affected by the cleaning process. Some chemicals, for example, may have a corrosive effect on paint or glass. The portions of building elements most vulnerable to deterioration may not be visible, such as embedded ends of iron window bars. Other totally unseen items, such as iron cramps or ties which hold the masonry to the structural frame, also may be subject to corrosion from the use of chemicals or even from plain water. The only way to prevent problems in these cases is to study the building construction in detail and evaluate proposed cleaning methods with this information in mind. However, due to the very likely possibility of encountering unknown factors, any cleaning project involving historic masonry should be viewed as unique to that particular building. Masonry cleaning methods generally are divided into three major groups: water, chemical, and abrasive. Water methods soften the dirt or soiling material and rinse the deposits from the masonry surface. Chemical cleaners react with dirt, soiling material or paint to effect their removal, after which the cleaning effluent is rinsed off the masonry surface with water. Abrasive methods include blasting with grit, and the use of grinders and sanding discs, all of which mechanically remove the dirt, soiling material or paint (and, usually, some of the masonry surface). Abrasive cleaning is also often followed with a water rinse. Laser cleaning, although not discussed here in detail, is another technique that is used sometimes by conservators to clean small areas of historic masonry. It can be quite effective for cleaning limited areas, but it is expensive and generally not practical for most historic masonry cleaning projects. Although it may seem contrary to common sense, masonry cleaning projects should be carried out starting at the bottom and proceeding to the top of the building always keeping all surfaces wet below the area being cleaned. The rationale for this approach is based on the principle that dirty water or cleaning effluent dripping from cleaning in progress above will leave streaks on a dirty surface but will not streak a clean surface as long as it is kept wet and rinsed frequently. Water cleaning methods are generally the gentlest means possible, and they can be used safely to remove dirt from all types of historic masonry. * There are essentially four kinds of water-based methods: soaking; pressure water washing; water washing supplemented with non-ionic detergent; and steam, or hot-pressurized water cleaning. Once water cleaning has been completed, it is often necessary to follow up with a water rinse to wash off the loosened soiling material from the masonry. *Water cleaning methods may not be appropriate to use on some badly deteriorated masonry because water may exacerbate the deterioration, or on gypsum or alabaster, which are very soluble in water. Prolonged spraying or misting with water is particularly effective for cleaning limestone and marble. It is also a good method for removing heavy accumulations of soot, sulfate crusts or gypsum crusts that tend to form in protected areas of a building not regularly washed by rain. Water is distributed to lengths of punctured hose or pipe with non-ferrous fittings hung from moveable scaffolding or a swing stage that continuously mists the surface of the masonry with a very fine spray. A timed on-off spray is another approach to using this cleaning technique. After one area has been cleaned, the apparatus is moved on to another. Soaking is often used in combination with water washing and is also followed by a final water rinse. Soaking is a very slow method—it may take several days or a week—but it is a very gentle method to use on historic masonry. Low-to-medium-pressure steam (hot-pressurized water washing) is a gentle method of softening heavy soiling deposits and cleaning historic marble. Photo: NPS files. Washing with low-pressure or medium-pressure water is probably one of the most commonly used methods for removing dirt or other pollutant soiling from historic masonry buildings. Starting with a very low pressure (100 psi or below), even using a garden hose, and progressing as needed to slightly higher pressure—generally no higher than 300-400 psi—is always the recommended way to begin. Scrubbing with natural bristle or synthetic bristle brushes—never metal which can abrade the surface and leave metal particles that can stain the masonry—can help in cleaning areas of the masonry that are especially dirty. Non-ionic detergents—which are not the same as soaps—are synthetic organic compounds that are especially effective in removing oily soil. (Examples of some of the numerous proprietary non-ionic detergents include Igepal by GAF, Tergitol by Union Carbide and Triton by Rohm & Haas.) Thus, the addition of a non-ionic detergent, or surfactant, to a low- or medium-pressure water wash can be a useful aid in the cleaning process. (A non-ionic detergent, unlike most household detergents, does not leave a solid, visible residue on the masonry.) Adding a non-ionic detergent and scrubbing with a natural bristle or synthetic bristle brush can facilitate cleaning textured or intricately carved masonry. This should be followed with a final water rinse. Steam cleaning is actually low-pressure hot water washing because the steam condenses almost immediately upon leaving the hose. This is a gentle and effective method for cleaning stone and particularly for acid-sensitive stones. Steam can be especially useful in removing built-up soiling deposits and dried-up plant materials, such as ivy disks and tendrils. It can also be an efficient means of cleaning carved stone details and, because it does not generate a lot of liquid water, it can sometimes be appropriate to use for cleaning interior masonry. Despite the fact that water-based methods are generally the most gentle, even they can be damaging to historic masonry. Before beginning a water cleaning project, it is important to make sure that all mortar joints are sound and that the building is watertight. Otherwise water can seep through the walls to the interior, resulting in rusting metal anchors and stained and ruined plaster. Some water supplies may contain traces of iron and copper which may cause masonry to discolor. Adding a chelating or complexing agent to the water, such as EDTA (ethylene diamine tetra-acetic acid), which inactivates other metallic ions, as well as softens minerals and water hardness, will help prevent staining on light-colored masonry. Any cleaning method involving water should never be done in cold weather or if there is any likelihood of frost or freezing because water within the masonry can freeze, causing spalling and cracking. Since a masonry wall may take over a week to dry after cleaning, no water cleaning should be permitted for several days prior to the first average frost date, or even earlier if local forecasts predict cold weather. Most important of all, it is imperative to be aware that using water at too high a pressure, a practice common to "power washing" and "water blasting", is very abrasive and can easily etch marble and other soft stones, as well as some types of brick. In addition, the distance of the nozzle from the masonry surface and the type of nozzle, as well as gallons per minute (gpm), are also important variables in a water cleaning process that can have a significant impact on the outcome of the project. This is why it is imperative that the cleaning be closely monitored to ensure that the cleaning operators do not raise the pressure or bring the nozzle too close to the masonry in an effort to "speed up" the process. The appearance of grains of stone or sand in the cleaning effluent on the ground is an indication that the water pressure may be too high. Chemical cleaners, generally in the form of proprietary products, are another material frequently used to clean historic masonry. They can remove dirt, as well as paint and other coatings, metallic and plant stains, and graffiti. Chemical cleaners used to remove dirt and soiling include acids, alkalies and organic compounds. Acidic cleaners, of course, should not be used on masonry that is acid sensitive. Paint removers are alkaline, based on organic solvents or other chemicals. Both alkaline and acidic cleaning treatments include the use of water. Both cleaners are also likely to contain surfactants (wetting agents), that facilitate the chemical reaction that removes the dirt. Generally, the masonry is wet first for both types of cleaners, then the chemical cleaner is sprayed on at very low pressure or brushed onto the surface. The cleaner is left to dwell on the masonry for an amount of time recommended by the product manufacturer or, preferably, determined by testing, and rinsed off with a low- or moderate-pressure cold, or sometimes hot, water wash.
More than one application of the cleaner may be necessary, and it is always a good practice to test the product manufacturerís recommendations concerning dilution rates and dwell times. Because each cleaning situation is unique, dilution rates and dwell times can vary considerably. The masonry surface may be scrubbed lightly with natural or synthetic bristle brushes prior to rinsing. After rinsing, pH strips should be applied to the surface to ensure that the masonry has been neutralized completely. Acid-based cleaning products may be used on non-acid sensitive masonry, which generally includes: granite, most sandstones, slate, unglazed brick and unglazed architectural terra cotta, cast stone and concrete. Most commercial acidic cleaners are composed primarily of hydrofluoric acid, and often include some phosphoric acid to prevent rust-like stains from developing on the masonry after the cleaning. Acid cleaners are applied to the pre-wet masonry which should be kept wet while the acid is allowed to "work", and then removed with a water wash.
Alkaline cleaners should be used on acid-sensitive masonry, including: limestone, polished and unpolished marble, calcareous sandstone, glazed brick and glazed architectural terra cotta, and polished granite. (Alkaline cleaners may also be used sometimes on masonry materials that are not acid sensitive--after testing, of course--but they may not be as effective as they are on acid-sensitive masonry.) Alkaline cleaning products consist primarily of two ingredients: a non-ionic detergent or surfactant; and an alkali, such as potassium hydroxide or ammonium hydroxide. Like acidic cleaners, alkaline products are usually applied to pre-wet masonry, allowed to dwell, and then rinsed off with water. (Longer dwell times may be necessary with alkaline cleaners than with acidic cleaners.) Two additional steps are required to remove alkaline cleaners after the initial rinse. First the masonry is given a slightly acidic wash--often with acetic acid--to neutralize it, and then it is rinsed again with water. Removing paint and some other coatings, stains and graffiti can best be accomplished with alkaline paint removers, organic solvent paint removers, or other cleaning compounds. 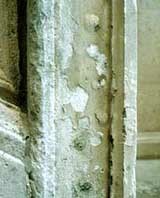 The removal of layers of paint from a masonry surface usually involves applying the remover either by brush, roller or spraying, followed by a thorough water wash. As with any chemical cleaning, the manufacturer's recommendations regarding application procedures should always be tested before beginning work. These are usually of much the same composition as other alkaline cleaners, containing potassium or ammonium hydroxide, or trisodium phosphate. They are used to remove oil, latex and acrylic paints, and are effective for removing multiple layers of paint. Alkaline cleaners may also remove some acrylic water-repellent coatings. As with other alkaline cleaners, both an acidic neutralizing wash and a final water rinse are generally required following the use of alkaline paint removers. The formulation of organic solvent paint removers varies and may include a combination of solvents, including methylene chloride, methanol, acetone, xylene and toluene. Other cleaning compounds that can be used to remove paint and some painted graffiti from historic masonry include paint removers based on N-methyl-2-pyrrolidone (NMP), or on petroleum-based compounds. Removing stains, whether they are industrial (smoke, soot, grease or tar), metallic (iron or copper), or biological (plant and fungal) in origin, depends on carefully matching the type of remover to the type of stain. Successful removal of stains from historic masonry often requires the application of a number of different removers before the right one is found. The removal of layers of paint from a masonry surface is usually accomplished by applying the remover either by brush, roller or spraying, followed by a thorough water wash. Since most chemical cleaning methods involve water, they have many of the potential problems of plain water cleaning. Like water methods, they should not be used in cold weather because of the possibility of freezing. Chemical cleaning should never be undertaken in temperatures below 40 degrees F (4 degrees C), and generally not below 50 degrees F. In addition, many chemical cleaners simply do not work in cold temperatures. Both acidic and alkaline cleaners can be dangerous to cleaning operators, and clearly, there are environmental concerns associated with the use of chemical cleaners. If not carefully chosen, chemical cleaners can react adversely with many types of masonry. Obviously, acidic cleaners should not be used on acid-sensitive materials; however, it is not always clear exactly what the composition is of any stone or other masonry material. For, this reason, testing the cleaner on an inconspicuous spot on the building is always necessary. While certain acid-based cleaners may be appropriate if used as directed on a particular type of masonry, if left too long or if not adequately rinsed from the masonry they can have a negative effect. For example, hydrofluoric acid can etch masonry leaving a hazy residue (whitish deposits of silica or calcium fluoride salts) on the surface. While this efflorescence may usually be removed by a second cleaning—although it is likely to be expensive and time-consuming—hydrofluoric acid can also leave calcium fluoride salts or a colloidal silica deposit on masonry which may be impossible to remove. Other acids, particularly hydrochloric (muriatic) acid, which is very powerful, should not be used on historic masonry, because it can dissolve lime-based mortar, damage brick and some stones, and leave chloride deposits on the masonry. Alkaline cleaners can stain sandstones that contain a ferrous compound. Before using an alkaline cleaner on sandstone it is always important to test it, since it may be difficult to know whether a particular sandstone may contain a ferrous compound. Some alkaline cleaners, such as sodium hydroxide (caustic soda or lye) and ammonium bifluoride, can also damage or leave disfiguring brownish-yellow stains and, in most cases, should not be used on historic masonry. Although alkaline cleaners will not etch a masonry surface as acids can, they are caustic and can burn the surface. In addition, alkaline cleaners can deposit potentially damaging salts in the masonry which can be difficult to rinse thoroughly. Graffiti and stains, which have penetrated into the masonry, often are best removed by using a poultice. A poultice consists of an absorbent material or clay powder (such as kaolin or fullerís earth, or even shredded paper or paper towels), mixed with a liquid (a solvent or other remover) to form a paste which is applied to the stain. The poultice is kept moist and left on the stain as long as necessary for it to draw the stain out of the masonry. As it dries, the paste absorbs the staining material so that it is not redeposited on the masonry surface. Some commercial cleaning products and paint removers are specially formulated as a paste or gel that will cling to a vertical surface and remain moist for a longer period of time in order to prolong the action of the chemical on the stain. Pre-mixed poultices are also available as a paste or in powder form needing only the addition of the appropriate liquid. The masonry must be pre-wet before applying an alkaline cleaning agent, but not when using a solvent. Once the stain has been removed, the masonry must be rinsed thoroughly. Generally, abrasive cleaning methods are not appropriate for use on historic masonry buildings. Abrasive cleaning methods are just that—abrasive. Grit blasters, grinders, and sanding discs all operate by abrading the dirt or paint off the surface of the masonry, rather than reacting with the dirt and the masonry which is how water and chemical methods work. Since the abrasives do not differentiate between the dirt and the masonry, they can also remove the outer surface of the masonry at the same time, and result in permanently damaging the masonry. Brick, architectural terra cotta, soft stone, detailed carvings, and polished surfaces, are especially susceptible to physical and aesthetic damage by abrasive methods. Brick and architectural terra cotta are fired products which have a smooth, glazed surface which can be removed by abrasive blasting or grinding. Abrasively-cleaned masonry is damaged aesthetically as well as physically, and it has a rough surface which tends to hold dirt and the roughness will make future cleaning more difficult. Abrasive cleaning processes can also increase the likelihood of subsurface cracking of the masonry. Abrasion of carved details causes a rounding of sharp corners and other loss of delicate features, while abrasion of polished surfaces removes the polished finish of stone. Mortar joints, especially those with lime mortar, also can be eroded by abrasive or mechanical cleaning. In some cases, the damage may be visual, such as loss of joint detail or increased joint shadows. As mortar joints constitute a significant portion of the masonry surface (up to 20 per cent in a brick wall), this can result in the loss of a considerable amount of the historic fabric. Erosion of the mortar joints may also permit increased water penetration, which will likely necessitate repointing. Blasting with abrasive grit or another abrasive material is the most frequently used abrasive method. Sandblasting is most commonly associated with abrasive cleaning. Finely ground silica or glass powder, glass beads, ground garnet, powdered walnut and other ground nut shells, grain hulls, aluminum oxide, plastic particles and even tiny pieces of sponge, are just a few of the other materials that have also been used for abrasive cleaning. Although abrasive blasting is not an appropriate method of cleaning historic masonry, it can be safely used to clean some materials. Finely-powdered walnut shells are commonly used for cleaning monumental bronze sculpture, and skilled conservators clean delicate museum objects and finely detailed, carved stone features with very small, micro-abrasive units using aluminum oxide. A number of current approaches to abrasive blasting rely on materials that are not usually thought of as abrasive, and not as commonly associated with traditional abrasive grit cleaning. Some patented abrasive cleaning processes—one dry, one wet—use finely-ground glass powder intended to "erase" or remove dirt and surface soiling only, but not paint or stains. Cleaning with baking soda (sodium bicarbonate) is another patented process. Baking soda blasting is being used in some communities as a means of quick graffiti removal. However, it should not be used on historic masonry which it can easily abrade and can permanently "etch" the graffiti into the stone; it can also leave potentially damaging salts in the stone which cannot be removed. Most of these abrasive grits may be used either dry or wet, although dry grit tends to be used more frequently. Ice particles, or pelletized dry ice (carbon dioxide or CO2), are another medium used as an abrasive cleaner. This is also too abrasive to be used on most historic masonry, but it may have practical application for removing mastics or asphaltic coatings from some substrates. Some of these processes are promoted as being more environmentally safe and not damaging to historic masonry buildings. However, it must be remembered that they are abrasive and that they "clean" by removing a small portion of the masonry surface, even though it may be only a minuscule portion. The fact that they are essentially abrasive treatments must always be taken into consideration when planning a masonry cleaning project. In general, abrasive methods should not be used to clean historic masonry buildings. In some, very limited instances, highly-controlled, gentle abrasive cleaning may be appropriate on selected, hard-to-clean areas of a historic masonry building if carried out under the watchful supervision of a professional conservator. But, abrasive cleaning should never be used on an entire building. Grinding the masonry surface with mechanical grinders and sanding disks is another means of abrasive cleaning that should not be used on historic masonry. Like abrasive blasting, grinders and disks do not really clean masonry but instead grind away and abrasively remove and, thus, damage the masonry surface itself rather than remove just the soiling material. Once the masonry and soiling material or paint have been identified, and the condition of the masonry has been evaluated, planning for the cleaning project can begin. In order to determine the gentlest means possible, several cleaning methods or materials may have to be tested prior to selecting the best one to use on the building. Testing should always begin with the gentlest and least invasive method proceeding gradually, if necessary, to more complicated methods, or a combination of methods. All too often simple methods, such as a low-pressure water wash, are not even considered, yet they frequently are effective, safe, and not expensive. Water of slightly higher pressure or with a non-ionic detergent additive also may be effective. It is worth repeating that these methods should always be tested prior to considering harsher methods; they are safer for the building and the environment, often safer for the applicator, and relatively inexpensive. The level of cleanliness desired also should be determined prior to selection of a cleaning method. Obviously, the intent of cleaning is to remove most of the dirt, soiling material, stains, paint or other coating. A "brand new" appearance, however, may be inappropriate for an older building, and may require an overly harsh cleaning method to be achieved. When undertaking a cleaning project, it is important to be aware that some stains simply may not be removable. It may be wise, therefore, to agree upon a slightly lower level of cleanliness that will serve as the standard for the cleaning project. The precise amount of residual dirt considered acceptable may depend on the type of masonry, the type of soiling and difficulty of total removal, and local environmental conditions. Cleaning tests should be carried out in an area of sufficient size to give a true indication of their effectiveness. It is preferable to conduct the test in an inconspicuous location on the building so that it will not be obvious if the test is not successful. A test area may be quite small to begin, sometimes as small as six square inches, and gradually may be increased in size as the most appropriate methods and cleaning agents are determined. Eventually the test area may be expanded to a square yard or more, and it should include several masonry units and mortar joints. It should be remembered that a single building may have several types of masonry and that even similar materials may have different surface finishes. Each material and different finish should be tested separately. Cleaning tests should be evaluated only after the masonry has dried completely. The results of the tests may indicate that several methods of cleaning should be used on a single building. When feasible, test areas should be allowed to weather for an extended period of time prior to final evaluation. A waiting period of a full year would be ideal in order to expose the test patch to a full range of seasons. If this is not possible, the test patch should weather for at least a month or two. For any building which is considered historically important, the delay is insignificant compared to the potential damage and disfigurement which may result from using an incompletely tested method. The successfully cleaned test patch should be protected as it will serve as a standard against which the entire cleaning project will be measured. The potential effect of any method proposed for cleaning historic masonry should be evaluated carefully. Chemical cleaners and paint removers may damage trees, shrubs, grass, and plants. A plan must be provided for environmentally safe removal and disposal of the cleaning materials and the rinsing effluent before beginning the cleaning project. Authorities from the local regulatory agency--usually under the jurisdiction of the federal or state Environmental Protection Agency (EPA)--should be consulted prior to beginning a cleaning project, especially if it involves anything more than plain water washing. This advance planning will ensure that the cleaning effluent or run-off, which is the combination of the cleaning agent and the substance removed from the masonry, is handled and disposed of in an environmentally sound and legal manner. Some alkaline and acidic cleaners can be neutralized so that they can be safely discharged into storm sewers. However, most solvent-based cleaners cannot be neutralized and are categorized as pollutants, and must be disposed of by a licensed transport, storage and disposal facility. Thus, it is always advisable to consult with the appropriate agencies before starting to clean to ensure that the project progresses smoothly and is not interrupted by a stop-work order because a required permit was not obtained in advance. Vinyl guttering or polyethylene-lined troughs placed around the perimeter of the base of the building can serve to catch chemical cleaning waste as it is rinsed off the building. This will reduce the amount of chemicals entering and polluting the soil, and also will keep the cleaning waste contained until it can be removed safely. Some patented cleaning systems have developed special equipment to facilitate the containment and later disposal of cleaning waste. Concern over the release of volatile organic compounds (VOCs) into the air has resulted in the manufacture of new, more environmentally responsible cleaners and paint removers, while some materials traditionally used in cleaning may no longer be available for these same reasons. Other health and safety concerns have created additional cleaning challenges, such as lead paint removal, which is likely to require special removal and disposal techniques. The lower floors of this historic brick and architectural terra-cotta building have been covered during chemical cleaning to protect pedestrians and vehicular traffic from potentially harmful overspray. Photo: NPS files. Cleaning can also cause damage to non-masonry materials on a building, including glass, metal and wood. Thus, it is usually necessary to cover windows and doors, and other features that may be vulnerable to chemical cleaners. They should be covered with plastic or polyethylene, or a masking agent that is applied as a liquid which dries to form a thin protective film on glass, and is easily peeled off after the cleaning is finished. Wind drift, for example, can also damage other property by carrying cleaning chemicals onto nearby automobiles, resulting in etching of the glass or spotting of the paint finish. Similarly, airborne dust can enter surrounding buildings, and excess water can collect in nearby yards and basements. Possible health dangers of each method selected for the cleaning project must be considered before selecting a cleaning method to avoid harm to the cleaning applicators, and the necessary precautions must be taken. The precautions listed in Material Safety Data Sheets (MSDS) that are provided with chemical products should always be followed. Protective clothing, respirators, hearing and face shields, and gloves must be provided to workers to be worn at all times. Acidic and alkaline chemical cleaners in both liquid and vapor forms can also cause serious injury to passers-by. It may be necessary to schedule cleaning at night or weekends if the building is located in a busy urban area to reduce the potential danger of chemical overspray to pedestrians. Cleaning during non-business hours will allow HVAC systems to be turned off and vents to be covered to prevent dangerous chemical fumes from entering the building which will also ensure the safety of the buildingís occupants. Abrasive and mechanical methods produce dust which can pose a serious health hazard, particularly if the abrasive or the masonry contains silica. To begin with, it is important to understand that waterproof coatings and water-repellent coatings are not the same. Although these terms are frequently interchanged and commonly confused with one another, they are completely different materials. Water-repellent coatings—often referred to incorrectly as "sealers", but which do not or should not "seal"—are intended to keep liquid water from penetrating the surface but to allow water vapor to enter and leave, or pass through, the surface of the masonry. Water-repellent coatings are generally transparent, or clear, although once applied some may darken or discolor certain types of masonry while others may give it a glossy or shiny appearance. Waterproof coatings seal the surface from liquid water and from water vapor. They are usually opaque, or pigmented, and include bituminous coatings and some elastomeric paints and coatings. Water-repellent coatings are formulated to be vapor permeable, or "breathable". They do not seal the surface completely to water vapor so it can enter the masonry wall as well as leave the wall. While the first water-repellent coatings to be developed were primarily acrylic or silicone resins in organic solvents, now most water-repellent coatings are water-based and formulated from modified siloxanes, silanes and other alkoxysilanes, or metallic stearates. While some of these products are shipped from the factory ready to use, other water-borne water repellents must be diluted at the job site. Unlike earlier water-repellent coatings which tended to form a "film" on the masonry surface, modern water-repellent coatings actually penetrate into the masonry substrate slightly and, generally, are almost invisible if properly applied to the masonry. They are also more vapor permeable than the old coatings, yet they still reduce the vapor permeability of the masonry. Once inside the wall, water vapor can condense at cold spots producing liquid water which, unlike water vapor, cannot escape through a water-repellent coating. The liquid water within the wall, whether from condensation, leaking gutters, or other sources, can cause considerable damage. Water-repellent coatings are not consolidants. Although modern water-repellents may penetrate slightly beneath the masonry surface, instead of just "sitting" on top of it, they do not perform the same function as a consolidant which is to "consolidate" and replace lost binder to strengthen deteriorating masonry. Even after many years of laboratory study and testing, few consolidants have proven very effective. The composition of fired products such as brick and architectural terra cotta, as well as many types of building stone, does not lend itself to consolidation. Some modern water-repellent coatings which contain a binder intended to replace the natural binders in stone that have been lost through weathering and natural erosion are described in product literature as both a water repellent and a consolidant The fact that the newer water-repellent coatings penetrate beneath the masonry surface instead of just forming a layer on top of the surface may indeed convey at least some consolidating properties to certain stones. However, a water-repellent coating cannot be considered a consolidant. In some instances, a water-repellent or "preservative" coating, if applied to already damaged or spalling stone, may form a surface crust which, if it fails, may exacerbate the deterioration by pulling off even more of the stone. Is a Water-Repellent Treatment Necessary? Water-repellent coatings are frequently applied to historic masonry buildings for the wrong reason. They also are often applied without an understanding of what they are and what they are intended to do. And these coatings can be very difficult, if not impossible, to remove from the masonry if they fail or become discolored. Most importantly, the application of water-repellent coatings to historic masonry is usually unnecessary. Most historic masonry buildings, unless they are painted, have survived for decades without a water-repellent coating and, thus, probably do not need one now. Water penetration to the interior of a masonry building is seldom due to porous masonry, but results from poor or deferred maintenance. Leaking roofs, clogged or deteriorated gutters and downspouts, missing mortar, or cracks and open joints around door and window openings are almost always the cause of moisture-related problems in a historic masonry building. If historic masonry buildings are kept watertight and in good repair, water-repellent coatings should not be necessary. Rising damp (capillary moisture pulled up from the ground), or condensation can also be a source of excess moisture in masonry buildings. A water-repellent coating will not solve this problem either and, in fact, may be likely to exacerbate it. Furthermore, a water-repellent coating should never be applied to a damp wall. Moisture in the wall would reduce the ability of a coating to adhere to the masonry and to penetrate below the surface. But, if it did adhere, it would hold the moisture inside the masonry because, although a water-repellent coating is permeable to water vapor, liquid water cannot pass through it. In the case of rising damp, a coating may force the moisture to go even higher in the wall because it can slow down evaporation, and thereby retain the moisture in the wall. Excessive moisture in masonry walls may carry waterborne soluble salts from the masonry units themselves or from the mortar through the walls. 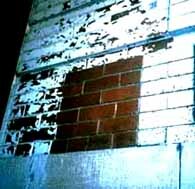 If the water is permitted to come to the surface, the salts may appear on the masonry surface as efflorescence (a whitish powder) upon evaporation. However, the salts can be potentially dangerous if they remain in the masonry and crystallize beneath the surface as subflorescence. 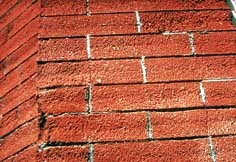 Subflorescence eventually may cause the surface of the masonry to spall, particularly if a water-repellent coating has been applied which tends to reduce the flow of moisture out from the subsurface of the masonry. Although many of the newer water-repellent products are more breathable than their predecessors, they can be especially damaging if applied to masonry that contains salts, because they limit the flow of moisture through masonry. There are some instances when a water-repellent coating may be considered appropriate to use on a historic masonry building. Soft, incompletely fired brick from the 18th-and early-19th centuries may have become so porous that paint or some type of coating is needed to protect it from further deterioration or dissolution. When a masonry building has been neglected for a long period of time, necessary repairs may be required in order to make it watertight. If, following a reasonable period of time after the building has been made watertight and has dried out completely, moisture appears actually to be penetrating through the repointed and repaired masonry walls, then the application of a water-repellent coating may be considered in selected areas only. This decision should be made in consultation with an architectural conservator. And, if such a treatment is undertaken, it should not be applied to the entire exterior of the building. Improper cleaning methods may have been responsible for the formation of efflorescence on this brick. Photo: NPS files. Anti-graffiti or barrier coatings are another type of clear coating—although barrier coatings can also be pigmented—that may be applied to exterior masonry, but they are not formulated primarily as water repellents. The purpose of these coatings is to make it harder for graffiti to stick to a masonry surface and, thus, easier to clean. But, like water-repellent coatings, in most cases the application of anti-graffiti coatings is generally not recommended for historic masonry buildings. These coatings are often quite shiny which can greatly alter the appearance of a historic masonry surface, and they are not always effective. Generally, other ways of discouraging graffiti, such as improved lighting, can be more effective than a coating. However, the application of anti-graffiti coatings may be appropriate in some instances on vulnerable areas of historic masonry buildings which are frequent targets of graffiti that are located in out-of-the-way places where constant surveillance is not possible. Some water-repellent coatings are recommended by product manufacturers as a means of keeping dirt and pollutants or biological growth from collecting on the surface of masonry buildings and, thus, reducing the need for frequent cleaning. While this at times may be true, in some cases a coating may actually retain dirt more than uncoated masonry. Generally, the application of a water-repellent coating is not recommended on a historic masonry building as a means of preventing biological growth. Some water-repellent coatings may actually encourage biological growth on a masonry wall. Biological growth on masonry buildings has traditionally been kept at bay through regularly-scheduled cleaning as part of a maintenance plan. Simple cleaning of the masonry with low-pressure water using a natural- or synthetic-bristled scrub brush can be very effective if done on a regular basis. 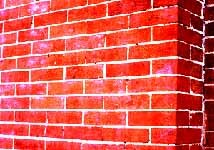 Commercial products are also available which can be sprayed on masonry to remove biological growth. In most instances, a water-repellent coating is not necessary if a building is watertight. The application of a water-repellent coating is not a recommended treatment for historic masonry buildings unless there is a specific problem which it may help solve. If the problem occurs on only part of the building, it is best to treat only that area rather than an entire building. Extreme exposures such as parapets, for example, or portions of the building subject to driving rain can be treated more effectively and less expensively than the entire building. Water-repellent coatings are not permanent and must be reapplied periodically although, if they are truly invisible, it can be difficult to know when they are no longer providing the intended protection. Testing a water-repellent coating by applying it in one small area may not be helpful in determining its suitability for the building because a limited test area does not allow an adequate evaluation of a treatment. Since water may enter and leave through the surrounding untreated areas, there is no way to tell if the coated test area is "breathable." But trying a coating in a small area may help to determine whether the coating is visible on the surface or if it will otherwise change the appearance of the masonry. In theory, waterproof coatings usually do not cause problems as long as they exclude all water from the masonry. If water does enter the wall from the ground or from the inside of a building, the coating can intensify the damage because the water will not be able to escape. During cold weather this water in the wall can freeze causing serious mechanical disruption, such as spalling. In addition, the water eventually will get out by the path of least resistance. If this path is toward the interior, damage to interior finishes can result; if it is toward the exterior, it can lead to damage to the masonry caused by built-up water pressure. 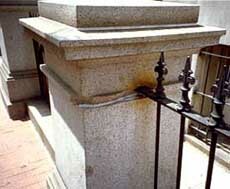 In most instances, waterproof coatings should not be applied to historic masonry. The possible exception to this might be the application of a waterproof coating to below-grade exterior foundation walls as a last resort to stop water infiltration on interior basement walls. Generally, however, waterproof coatings, which include elastomeric paints, should almost never be applied above grade to historic masonry buildings. A well-planned cleaning project is an essential step in preserving, rehabilitating or restoring a historic masonry building. Proper cleaning methods and coating treatments, when determined necessary for the preservation of the masonry, can enhance the aesthetic character as well as the structural stability of a historic building. Removing years of accumulated dirt, pollutant crusts, stains, graffiti or paint, if done with appropriate caution, can extend the life and longevity of the historic resource. Cleaning that is carelessly or insensitively prescribed or carried out by inexperienced workers can have the opposite of the intended effect. It may scar the masonry permanently, and may actually result in hastening deterioration by introducing harmful residual chemicals and salts into the masonry or causing surface loss. Using the wrong cleaning method or using the right method incorrectly, applying the wrong kind of coating or applying a coating that is not needed can result in serious damage, both physically and aesthetically, to a historic masonry building. Cleaning a historic masonry building should always be done using the gentlest means possible that will clean, but not damage the building. It should always be taken into consideration before applying a water-repellent coating or a waterproof coating to a historic masonry building whether it is really necessary and whether it is in the best interest of preserving the building. Robert C. Mack, FAIA, is a principal in the firm of MacDonald & Mack Architects, Ltd., an architectural firm that specializes in historic buildings in Minneapolis, Minnesota. Anne E. Grimmer is a Senior Architectural Historian in the Technical Preservation Services Branch, Heritage Preservation Services Program, National Park Service, Washington, D.C. The original version of Preservation Brief 1: The Cleaning and Waterproof Coating of Masonry Buildings was written by Robert C. Mack, AIA. It inaugurated the Preservation Briefs series when it was published in 1975. The following historic preservation specialists provided technical review of this publication: Frances Gale, Training Director, National Center for Preservation Technology and Training, National Park Service, Natchitoches, LA; Judith M. Jacob, Architectural Conservator, Building Conservation Branch, Northeast Cultural Resources Center, National Park Service, N.Y., NY; Robert M. Powers, Architectural Conservator, Powers and Company, Inc., Philadelphia, PA; Antonio Aguilar, Kaaren Dodge, JoEllen Hensley, Gary Sachau, John Sandor and Audrey T. Tepper, Technical Preservation Services Branch, National Park Service, Washington, DC; and Kay D. Weeks, Heritage Preservation Services Program, National Park Service, Washington, DC. Architectural Ceramics: Their History, Manufacture and Conservation. A Joint Symposium of English Heritage and the United Kingdom Institute for Conservation, September 22-25, 1994. London: English Heritage, 1996. Ashurst, Nicola. 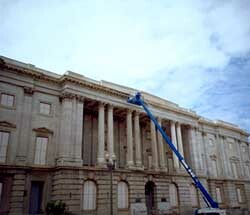 Cleaning Historic Buildings. Volume One: Substrates, Soiling & Investigation. Volume Two: Cleaning Materials & Processes. London: Donhead Publishing Ltd., 1994. Association for Preservation Technology. Special Issue: Preservation of Historic Masonry. 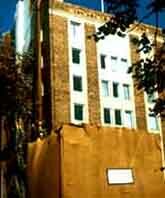 Papers from the Symposium on Preservation Treatments for Historic Masonry: Consolidants, Coatings, and Water Repellents, New York, New York, November 11-12, 1994. APT Bulletin. Vol. XXVI, No. 4 (1995). Grimmer, Anne E. Preservation Brief 6: Dangers of Abrasive Cleaning to Historic Buildings. Washington, DC: Preservation Assistance Division, National Park Service, U.S. Department of the Interior, 1979. Grimmer, Anne E. Keeping it Clean: Removing Exterior Dirt, Paint, Stains and Graffiti from Historic Masonry Buildings. Washington, DC: Preservation Assistance Division, National Park Service, U.S. Department of the Interior, 1988. Park, Sharon C., AIA. Preservation Brief 39: Holding the Line: Controlling Unwanted Moisture in Historic Buildings. Washington, DC: Heritage Preservation Services, National Park Service, U.S. Department of the Interior, 1996. Powers, Robert M. Preservation Tech Note, Masonry No. 3, "Water Soak Cleaning of Limestone". Washington, DC: Preservation Assistance Division, National Park Service, U.S. Department of the Interior, 1992. Sinvinski, Valerie. "Gentle Blasting." Old-House Journal. Vol. XXIV, No. 4 (July-August 1996), pp. 46-49. Weaver, Martin E. Conserving Buildings: A Guide to Techniques and Materials. New York: John Wiley & Sons, Inc., 1993. Weaver, Martin E. Preservation Brief 38: Removing Graffiti from Historic Masonry. Washington, DC: Preservation Assistance Division, National Park Service, U.S. Department of the Interior, 1995. Winkler, E.M. Stone in Architecture: Properties, Durability. Third, completely revised and extended edition. Berlin, Germany: Springer-Verlag, 1997.